Nothing like a plate full of rainbows to brighten up any day! Ever since I spotted rainbow cookies on The Cookie Shop(Love this blog!) I have wanted to make them, and what better time to do it than March with St.Patrick's Day upon us! We've been having some rain with a little sunshine thrown in and with that combination you can usually find a rainbow if you look hard enough! With the leftover scraps of rainbow I made some lollipop cookies. I just squished it all together, rolled it into ropes and coiled them up. When they were still warm and soft from the oven I inserted the lollipop stick...so simple, but so sweet! I have made "edible-image" cookies one other time; I put rubber ducky images on round sugar cookies for a baby shower(for my daughter, Sarah). I haven't really thought about doing it again until I came upon Bakerella's valentine cookies and then I knew I HAD to make some, SOON! So, I hunted on the internet for some vintage St.Patrick's Day images and found these FREE postcards! They're a little more vintage than I'd like (I was thinking 1950s-'60s), but they are pretty cute! I didn't go out and buy my own printer/edible ink set-up (That IS in the works!) like Bakerella did, but instead went to the local bakery and they printed them for me on their fondant sheets with the food color ink. Definitely more pricey than doing it with your own equipment, but I didn't want to wait. But still, I think they turned out pretty darn cute! Of course I had to sample one...Very soft and tasty! I just used my "No Fail Sugar Cookies" recipe and royal icing and put the image on the cookie when the icing was wet. When the icing dried I added the green trim following along the postcard's edge. The possibilities are endless!!! I can't wait for Easter! 2. In a medium bowl combine flour, baking powder and salt. Add dry ingredients to the creamed mixture. Stir till soft dough forms. Divide dough into fourths. Tint each with a different food color. Wrap in plastic wrap and chill for 2 hours. 3. Preheat oven to 350 degrees F (175 degrees C). Working with half of each color, shape dough into 3/4 inch balls and for each cookie place 1 pink, 1 green, 1 blue and 1 orange (I used red, yellow, blue and green) ball together to make 1 large ball. Shape into a 12 inch long roll (like a snake), starting at one end, coil roll to make a 2 3/4 inch round cookie. Place cookies 3 inches apart on lightly greased baking sheet. Carefully insert lollipop sticks into bottoms of cookies. 4. Bake cookies for 8 minutes or until lightly browned. Cool and store in an airtight container. I have *always* wanted to make vintage postcard cookies! :) They turned out so cute! These are so cute and festive! I gotta get my St. Patrick's Day baking started. Both of these cookies are adorable. The vintage postcards are rock star quality! Wow! This whole post is so beautiful! I want to make those rainbows - and those st. paddy's cookies, they are just so awesome! love the beautiful rainbow cookies..thanks for sharing the recipe!! oh..cant take my eyes from those adorable vintage postcard cookies. so cute!! These are so cute! I just got an order for a cookie with an edible image and thought I would ask a local bakery to print them up...how much did that cost you? What a fun way to celebrate - too cute! OH wow, those vintage cookies are amazing!!! Great job with those, they look too good to eat. And I love love the rainbow cookies. How CUTE are they hanging off a mug of coffee or tea??? I love those too. Great cookies! Save! Sue this is a great post. I have to try the rainbows. Thank you so much for linking up :) I love these rainbow cookies! I’m planning the St. Patrick’s Day party for my daughter’s class. 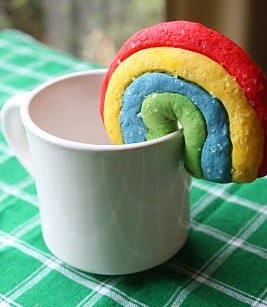 I can’t wait to make the rainbow cookies..they will be a hit with the kids! I found some cello candy bags from Box and Wrap that have shamrocks on the bags….so cute. It’s the extra special touches that make the party great. Thanks so much for the recipe.